WHILE we celebrate Pakistan’s sensational victory in the Asia Cup against Bangladesh at Dhaka we must also not ignore the fact that the game that we are passionately in love with owes much to the pioneering work initially taken up by the Parsi community who were the first ones in the subcontinent to fall in love with the English game and then popularise it in the length and width of the country. Played by the sailors, tradesmen and mariners of the East India company, cricket traces its history in the subcontinent as long back as 1721 when on the west coast of Cambay near Bombay (now Mumbai) and in Kutch the Englishmen were seen indulging in it. The Parsis settled in these areas having migrated from Iran nearly a thousand years ago being well suited because of their cool and quiet temperament very similar to the Englishmen. Therefore, they were the first to adopt the game which later was picked up by the Hindus and Muslims as East India Company spread its wings and British Raj took over which resulted in the soldiers of the army posted in garrison towns making it even more popular. Inspired and encouraged, the Parsis then formed the Oriental Cricket Club in Bombay in 1846 and then a Parsi Cricket Club backed up by one A.B. Patel to play regularly against the Europeans. That of course gave them the idea of touring England, the mother country of the game with which they had fallen in love with. 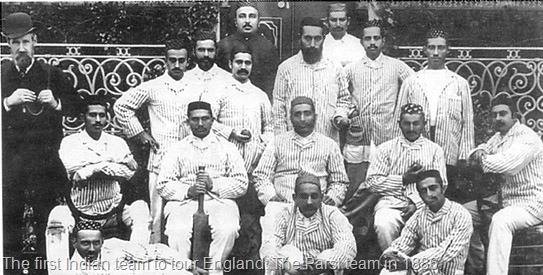 The first two teams from India, therefore, to leave the shores in 1886 and in 1888 to tour England consisted of only Parsi players. The one in 1886 was led by one Dhanjishaw H. Patel, an underhand bowler, and also in the team were three Parsis — Pestonji Dinshaw Dastur, Dinshaw D. Khambatta and Burorji P. Balla — from Karachi. Their tour was a huge failure for the fact that they were not trained and experienced to play against the English bowlers and batsmen. In 28 matches on the tour, they lost 19, drew eight and won only once against the Normanhurst team. Dastur, Balla and Khambatta remain the only Karachiites to have played against Grace. The other important match that they played was at Great Windsor Park against the grandson of Queen Victoria Prince Christian Victor in which his brother Prince Albert also played. Not forgetting of course the match against Lord Sheffield XI in which Alfred Shaw, the man who bowled the first ball in Test cricket in 1877 against Australia also played. Dastur of Karachi, whose highest score on tour was 89 against North Riding at Middlesborough in Yorkshire, also had the honour of leading the batting averages of the tour. delighted when I told him of his grandfather’s achievements which he did not seem to know. He moaned the fact that he did not even have his picture in the family. When I told him that I have it in my collection, he was over the moon; even more happy when I presented him the group photo of the 1886 Parsis in England. Balla’s and Khambatta’s families sadly still remain untraced. As cricket established its roots, India produced great Parsi cricketers like Polly Umrigar, Nari Contractor and Farukh Engineer, Rusi Surti to name a few. Karachi Parsi Institute (KPI) formed in 1893 could also boast fine cricketers one of which Rusi Dinshaw toured India with Pakistan team in 1952 but did not play in Tests. A.H. Mehta was even on the staff of Lancashire at Old Trafford but failed to qualify as their main player. Jamshed Khudadad Irani played for India. Other fine Karachi cricketers were S.K. Irani, S.R. Mavalvala, Rusi and Homi Mobed the nephew of Minochehr Mobed who was one of the umpires with Daud Khan when Pakistan beat MCC in 1951 in an unofficial Test at Karachi Gymkhana by four wickets to gain Test status. Minochehr Mobed had played in the Sind Pentangular in 1919 and his nephew had toured England with Pakistan Eaglets. Not forgetting the services of Bomi Khambatta, Jagus and Jamshed Markar, the diplomat and cricket commentator who as ambassador, high commissioner and Pakistan envoy to UNO excelled in his job. Let us therefore pay them a huge tribute for their contribution and wish them a ‘Happy Nauroz’.